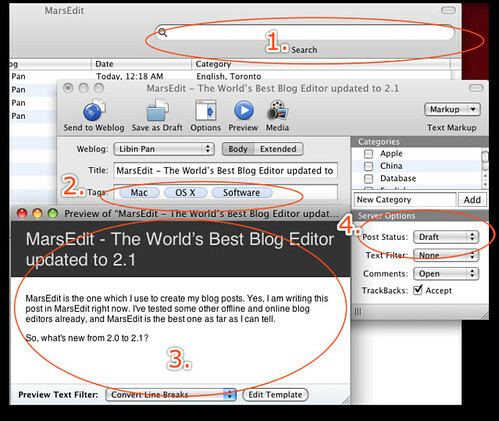 MarsEdit is the one which I use to create my blog posts. Yes, I am writing this post in MarsEdit right now. I’ve tested some other offline and online blog editors already, and MarsEdit is the best one as far as I can tell. So, what’s new from 2.0 to 2.1? Now you can quickly filter your posts and drafts by keywords. Just type a word or phrase into the toolbar search field, and MarsEdit will restrict the post listing to only items that contain the text you’ve typed. For supported systems, including Movable Type and WordPress, MarsEdit now offers a field for capsule-style tagging of your posts. It even remembers the tags you’ve typed before, so you’ll be able to reuse them in a jiffy on future posts. MarsEdit’s built-in preview sports a sleek new default appearance, massively enhanced performance, and fine-tuned usability. Now previews update quickly and without flickering or jumping around as you edit your post. A new Post Status popup in the options pane lets you choose between Published and Draft status. Server support for this feature is somewhat hit-or-miss, so be sure to test with something not too embarrassing!